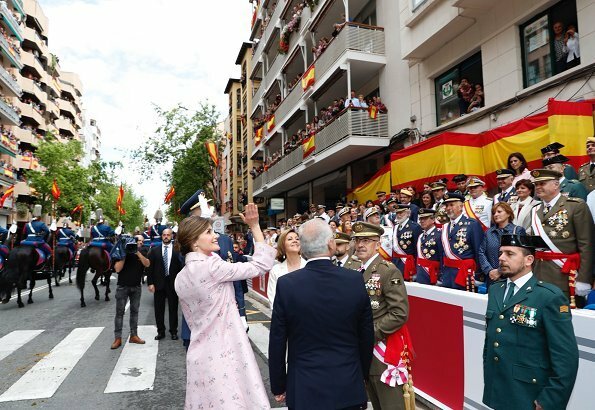 On May 26, 2018, King Felipe VI and Queen Letizia of Spain presided over "Armed Forces Day 2018" events held in Logrono this year. The King and the Queen then held a reception for the military commission of Military Departments and Civil Guards. "Armed Forces Day" celebrations is an annual national festival that honors armies and encourages information exchange and integration with the society. I love classic line and summery print.Queen looks elegant but also lovely. Agree, lovely and elegant and a nice flattering hairdo. I really do not care for this coat: too short in length and sleeves and it looks like a child's reject. I am sorry because I generally love her look. It seems an odd choice, when the country is honoring the military, to wear childish-looking clothes. The military are serious people in difficult jobs. chlidish??? really?? not in Spain.. This CH coat is appropriate for a spring day. The lady mayor of logrono is wearing a similar print. Looking at paintings of earlier Spanish royals you will see that the girls were wearing mini versions of what the adult women wore. If she is covered and well presented what does that have to do with honoring the military. Weird extrapolation. This was the King's show and he took it very seriously. Muy corto. 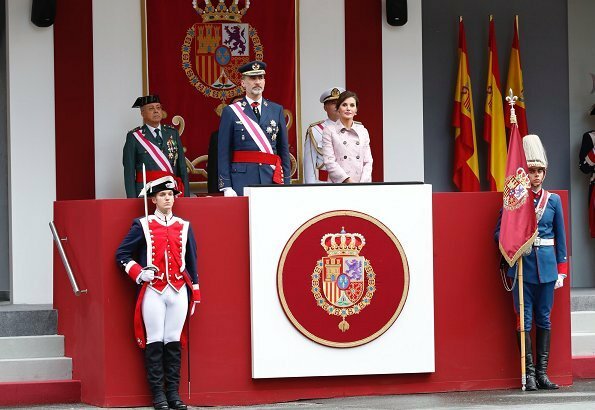 Letizia proyecta una imagen distinta cuando quiere y ha probado que puede hacer las cosas muy bien. I didn't like this coat the first time she wore it, and I still don't like it. Looks like something one of her daughters would wear. For such a serious occasion I find this coat not to be the proper attire. The coat is to childish,for an adult OMO. It would be ok for one or both of her daughters, but not for her and not today. I agree with the prespective of K H.
Oh, I like the coat, quite a lot in fact. To me, it doesn´t come across as juvenile but instead a bit 60s retro. I think it´s flattering, perfectly decent and very season-apropriate. I don´t know whether it´s inappropriate for the occasion, but judging from the photos, the festivities don´t seem to be of the solemn kind or remembrance-like honoring victims or the like. It actually looks almost like a street festival in a random neighborhood, with a parade and lots of people cheering from their balconies. 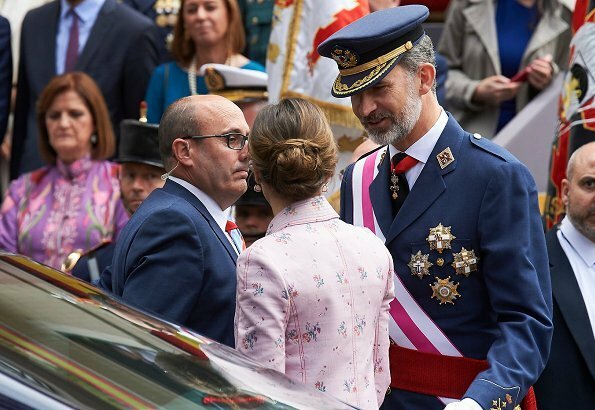 It is formal, yes, and military representatives attended in their uniforms, and so did the king, but it doesn´t appear to be disrespectful of Letizia to wear this type of outfit, and I can see plenty of other people dressed in anything but somber and overly conservative outfits. Totally agree! This coat is a true classic style. Letizia has the figure that can wear it and she looks good. The floral fabric is not inappropriate for this occasion. In fact, in the second picture, another woman is wearing a floral dress. If her 11 and 12 year old daughters wore this coat, I think it would be far too old for them. Wonderful outfit for a wonderful day. Right!! it's a festival in Spain we don't have remembrances or something similar..
A mí no me parece corto el abrigo en absoluto. 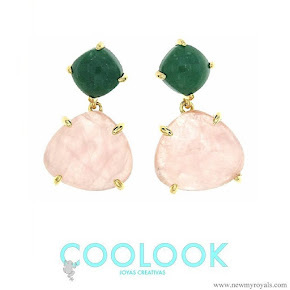 Está justo encima de la rodilla y tiene un color precioso y muy primaveral. No tiene nada de infantil ni irrespetuoso, menuda idiotez. Precioso el moño, los pendientes y los zapatos. Totalmente de acuerdo.., ya se metieron los extranjeros a opinar y no entienden nada...No tiene q ver nada con ningún remembrance...ni nada.. The "extranjeros" may not understand what the event is about but they are still entitled to state their opinions. I don't like it - nothing to do with the event, didn't like it last time either. Perfecto.... childis??? y luego las mandáis a España en pantalones cortos y camiseta?? no he visto ninguna adolescente extranjera así en España....van hechas un desastre.. I'm still not overly keen on this coat - I don't love this shade of pink on Letizia, there's something off about the length for me and from certain angles the hem looks odd, a bit crooked. Hair, make up, jewellery and other accessories all lovely. Just not one of my favourite Letizia looks. Anonymous (¿? }: About the comment "La guardia civil os not very loved in Spain." You really know nothing about Spain and spaniards. La Guardia Civil is probably one of the most respected army force in Spain and has given thoughout his history constant demonstrations of sacrifice and courage. La Guardia Civil lost a great number of his members victims of ETA terrorism. Spanish population shows them great respect. Está claro, María. Cuando se trata de la Reina de España, aquí cualquiera se atreve a soltar idioteces sobre la Guardia Civil, cuestionar las relaciones familiares, las acusaciones sobre su papel como madre y hasta meterse con unas niñas que se visten como niñas. De ninguna otra Casa Real se dicen disparates semejantes. Tengo clarísimo de dónde son todos esos anónimos que antes sí tenían nombre, ¿tú no? ¡Muy bien, María¡. Estoy totalmente de acuerdo contigo. Once again, people make asinine and uneducated comments about the armed forces of a sovereign country. This is a fashion blog and not a political forum, or a platform to disrespect people or institutions. I do like Queen Letizia's outfit, it's retro & trendy at the same time, very feminine and I can't see anything childish about it, I won't put it in the category of fantastic, but the end result works for me. I understand that this style may not be for everybody, and we are all entitled to our opinions, but introducing ridiculous and propagandistic comments has nothing to do do with the essence of this blog. Well said! The comment about la Guardia Civil not being loved in Spain is mean, outrageous, and completely false.The person who made this comment either doesn't know anything about Spain or is politically biased. I don't think that kind of offensive and disrespecful comments should be allowed in a fashion blog like this one. No doubt this is a fashion blog. It would be wonderful if all comments were about fashion but, unfortunately, sometimes bloggers share false and harmful comments and opinions about institutions, habits, behaviour and people of other countries. We feel the need and we have the right to put things clear. Thank you Cherry. I agree this is bot the best outfit of Letizia. Totalmente de acuerdo María y a veces tienen la osadía de discutir si algo es apropiado "protocolariamente" sin entender el acto ni la cultura, tipo no sombreros en la iglesia, o pantalones q lleva su Majestad la Reina de España. Esta claro q uno puede tener unos gustos u otros pero y se puede comentar sobre moda, pero no sobre el país, cultura, tradiciones, instituciones, protocolo y sin querer aprender. It suits her very well but it's not appropriate for the occasion. Should have wore a more formal outfit. She has exquisite taste and clothes, we've seen it before and a lot of times. Again!! It's a festival!! no time for more formal outfit, it's perfect!! Can't you see the Mayor of Logroño in a similar outfit?? Esto es muy cansino..Has visto María, saben lo q es appropriate en un país q desconocen....que pesadas!! Please share what would be formal for this occasion? The Minister of Defense (next to her in red dress and coat) who is one of the most powerful women in the country and has to project a much more sober image both locally and internationally is showing quite a bit of cleavage. Formal, or not so much? 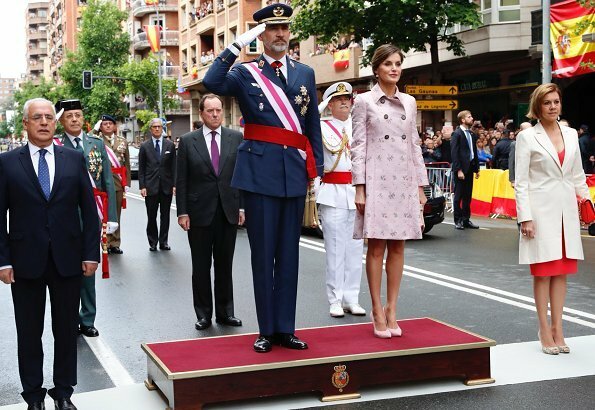 Do you really think that the Queen of Spain is not aware of the protocol in Spain??? Another point, recently the Queen has said that someone she cares about is fighting cancer. This week she has worn a lot of pink which is the signature color cancer societies and researchers. Sometimes there are reasons beyond the obvious for certain fashion choices. Petit fleur, what do you think would be more formal? A hat?, Leather gloves?, A bonnet?. 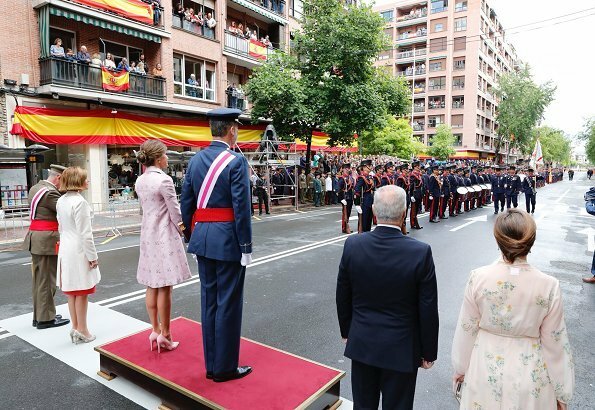 May be these accesories are proper for these ceremonies in other countries and monarchies but not in Spain. We dont use them often, just in certain wedding ceremonies. Be sure everybody here un Spain would think she looked ridiculous. Completely out of place. Of course Letizia knows protocol. She wore a hat few months ago in the official visit yo U.K. Just one thing: a bit longer would be better. Letizia is especially in Spanish blogs and newspapers heavily criticized for not following protocol. In comparision, this blog is and always was very Letizia friendly. Los blogueros y periodistas españoles no tienen, en su mayoría, NI IDEA de protocolo. Juzgan según sus propios deseos o los criterios de quienes les pagan. Y lo que vende es la crítica negativa, aunque sea inventada. Personally I am more interested in the role monarchies have in they country, the emphasis they give to events and people with merit than only their outfit. Opinions whether an outfit is appropriate or not, vary with time. Sea como sea, no entiendo por qué tiene que ir vestida de chica ye-yé al desfile de las FFAA. Siempre es un acto formal, muchas personas trabajan duro en la defensa de nuestro país. De hecho, el rey entrega una corona por los caídos. La ministra va pse psá, y la alcaldesa, pues lleva un vestido con manga larga y largo adecuado. The concept of fashion, like physics or applied mathematics, is sometimes difficult to comprehend. It is OK. The outfit as shown above was not created for a child. As is said by Anon 1:33 one has to be willing to learn. ¿La alcaldesa lleva manga larga? Anda, ¿y la Reina lleva tirantes o qué? Si no recuerdo mal, las chicas ye-yé llevaban minifalda y el abrigo de la Reina está lejos de eso. El estampado es diminuto, discreto y muy parecido al de la alcaldesa. La ministra va enseñando canalillo y la Reina bien tapada... Pero cuando el objetivo es criticar, no nos va a detener ningún razonamiento ¿verdad? Cuanta bobada por un abrigo, el modelo, la largura, pues no tiene cien años puede enseñar las rodillas, no es irrespectuoso, que tiene que ver la Guardia Civil y su ropa , cuanta incoherencia , cuando solo guia el deseo de criticar los comentarios estan en la cima de lo absurdo. Veo que la ministra lleva un escote bastante profundo, esta permitido???? porque cuando leo tanta tonteria , para quien lo ha olvidado estamos en 2018! No hay nada peor que una mujer criticando a otra mujer, asi desde luego no avanzarermos. 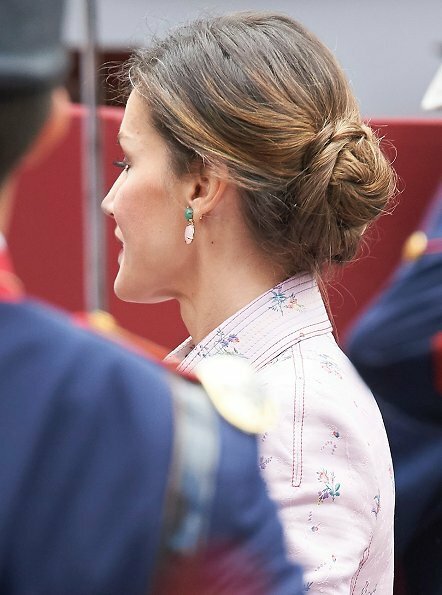 I actually prefer this ensemble on Letizia with her hair worn up, she looks lovely.